Aberdeen manager Derek McInnes stressed the importance of getting the win after beating Celtic 2-1 to go top of the Scottish Premiership. 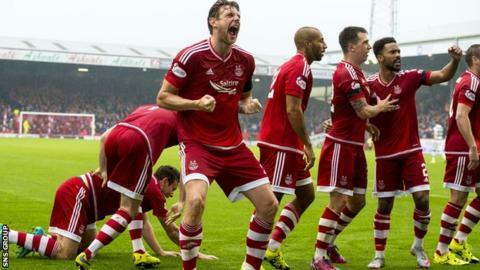 The Dons have made their best ever start to a campaign, with six consecutive victories. And, after, losing all four league meetings with Celtic last term, McInnes was "delighted" to end that sequence. "It was important that we see that improvement and the improvement has to come with results," he said. "The performance was probably similar to a lot of the games last year but nobody really is bothered too much about that, it's the results that play the part in past comment. "It was important we got the result, rather than performance. "For us, it is three points. There's no point in doing that and then not winning the game on Tuesday at home to Hamilton so we know that each and every game presents a challenge because we're not wholly better than anybody else but we do have a confidence that if we perform to our levels we're capable of winning games. "I think it is important for the supporters to see, it makes it more genuine and that's great, that's what being a supporter is." The Dons were urged on by a passionate home crowd as they came back from a goal down to win, with Paul Quinn's late winner coming after the hosts had Jonny Hayes sent off for a challenge on Mikael Lustig. "You see the atmosphere today, it was absolutely rocking, it was brilliant and that's what you want," added McInnes. "That's what you anticipate that it can be like. "You see what it meant to them but my players were measured with their celebrations, we know it's three points and it was an important three points but it's early on in the season and we've got work to do all the same. "My kit man said 'that felt like 20 years ago' in terms of the atmosphere. It's the best I've seen, it was absolutely brilliant. I think you could see the need and the urge from them. "They played their part, without question, especially when we go to 10 men but my players have got that. My players play like supporters, not in terms of their ability but in terms of their passion. "Every game we play's got the same importance but today possibly had that bit more importance on it." Celtic took the lead through a Leigh Griffiths penalty but Adam Rooney levelled from the spot after Graeme Shinnie had been bundled over by Dedryck Boyata. "Delighted, we get our just rewards," McInnes told BBC Scotland. "I thought we were the better team first half and then we go behind. "But the response was terrific. I said to the players at half-time that the script's already getting written. The journalists up there'll be writing the story, 'good old Aberdeen but fall short again' and it's only us that can change it. "No more than we deserved when Shinnie gets brought down for the penalty. "You always feel there's another opportunity coming and delighted big Quinny gets the winning goal." As well as disagreeing with Hayes dismissal, McInnes thought his side were due another spot-kick for a handball by Charlie Mulgrew. "Having seen it again, my impression was that we should have a penalty and Jonny shouldn't be red-carded," added McInnes. "It's not a two-footed challenge. If he (the referee) sees again, I'd be surprised if he thought it was a red card but it is what it is. We had to deal with it and we dealt with it."